The Four Principles are in many ways the most conventional element of the System’s description of the spiritual reality of the cosmos and show strong affinities with material from Yeats’s esoteric interests. There are several similar anatomies of the human soul, ranging from four- and five-fold divisions in classical Indian thought, through various Cabbalistic and Neoplatonic divisions, to a fourfold division proposed by Anna Kingsford in her esoteric Christianity. Specifically, as their name suggests, there are parallels with the Theosophists’ Seven Principles of the human constitution, though the dominant number of Theosophy, seven, is replaced by the Yeatses’ fourfold symmetry. Despite this, they have still caused readers problems and some bewilderment, largely from the subtleties of their relationship with the Faculties. In life and history the Faculties dominate, impinging more immediately on everyday concerns and are more readily discernible in experience. Since the effects they are said to produce take place within the phenomenal world, the reader can at least grasp half of the construct. In contrast, the Principles operate in an environment of which we are unaware, the unconscious and the after-life, so that both the Principles and the reality that they construct must be taken almost as dogma. It is significant that the parallels with other esoteric schemes should be found in relation to the Principles rather than the Faculties, since the Principles in Yeats’s System represent the spiritual dimension of the human being. While other esoteric schemes are based upon spiritual aspiration and tend to denigrate ordinary consciousness as a trap to be escaped, Yeats’s approach is far less mystical, focusing on the drama of worldly life played out in the Faculties and regarding the spiritual tasks of existence as being more properly carried out after death, or possibly during sleep. The Principles balance the Faculties and represent reality, and their reality is ultimately a form of unity. The Principles are essential to the System, yet Yeats claimed to have neglected them in A Vision A, on account of his imperfect understanding, and they certainly receive less attention than in the second version, but it is partly because they also represent a less radical departure from esoteric tradition that he was more concerned with presenting the differences from other systems in this earlier, privately printed volume. When they are expounded in the fuller exposition of A Vision B, these spiritual constituents of being are treated with a distant impersonality, dominated by metaphysical geometry rather than spiritual insight. As much as any part of the System, they are presented through ‘what must seem an arbitrary, harsh, difficult symbolism. Yet such has almost always accompanied expression that unites the sleeping and waking mind’ (AV B 23). Since the Principles operate within the sleeping mind of incarnate man, their symbolism is particularly intractable. Although the Principles are present in the individual being throughout its existence, during incarnate life they are largely in abeyance. The Faculties are discarded at death and the Principles come into their own, but of the four Principles, only the two Solar ones, the Celestial Body and the Spirit, outlast a single, complete Phase of embodied and disembodied existence. The Celestial Body is the individual manifestation of impersonal Godhead, ‘the portion of Eternal Life which can be separated away’ (AV A 160), it is the personal fragment of ‘the Divine Ideas in their unity’, which can also be glossed in terms borrowed from Coleridge as ‘the universal, the eternal, the necessary’ or ‘God, the soul, eternal truth’ (AV B 187 &n). In a late typescript draft of AV B Yeats distinguishes between the Celestial Body united to the Spirit representing ‘the Divine Idea’, but adds that ‘when they are separate [it is] the unity of nature’, implying that on its own Celestial Body is related less to Platonic forms than to Newtonian laws of the natural world, so that during life it gives ‘a fixed structure to the physical world’, and only after death ‘the great regulative forms of the moral life - God, Justice, Peace’. Spirit is ‘almost abstract mind’ (AV A 160) or Coleridge’s ‘reason’, the active perception of the Divine Ideas (AV B 187), and is the single most important Principle, representing the spiritual individuality. In contrast, the two Lunar Principles, Passionate Body and Husk, are particular to an individual incarnation, freshly acquired prior to each new birth and linked to the corporeal senses. The Husk controls the body’s ‘sensuous and instinctive’ fabric. The Passionate Body is associated with ‘passion’ or the objects of desire (AV A 160). These two are shed in stages after death, the Husk, typically shortly after physical death and the Passionate Body before the Beatitude, when Spirit and Celestial Body come together alone. The necessary truth in which the Principles ‘find their unity’ is the Celestial Body, the permanent Solar objective, whereas the ‘Faculties find theirs in the Mask’, the transient Lunar image (AV B 188), therefore, although the Principles are ‘the innate ground of the Faculties, and must act upon one another in the same way’ that the Faculties do (AV B 187), they do so with a very different focus and process. For the antithetical person the Mask is to some extent chosen and created by the Will, a Protean target of unattainable desire, and even for the primary Phases, where the Mask is enforced from without, it is very much an unfixed goal. In contrast the Celestial Body is real, permanent and inevitable, the first ground from which the being arises and the final goal to which it returns. The Celestial Body is represented by the sphere or diagrammatically by the diamond-like double cone, and can be thought of as a spark originating from the divine fire, or a drop of water from the ocean, separated away from Eternal Life in order to acquire experience. In itself it is isolated and self-contained, unable to function or operate in any way. The Spirit represents its transformation into movement or consciousness, describing a single gyre within the sphere or diamond. This movement is measured according to the Solar scale of the Zodiac rather than the Lunar one of the Phases, so that it completes one year or complete passage through the signs of the Zodiac during the period of a life and after-life. The Spirit’s gyre symbolises the completion of a single cycle, so passes through the Zodiac once per lifetime (including after-life). The reason for using the diamond-shape rather than the sphere itself lies in making this cycle a little clearer, since the two critical points, birth and death, are marked by the two apex-points of the diamond. Spirit’s passage from the apex marked Libra symbolises the beginning of earthly life, while its arrival at the other apex of Aries symblises death and the beginning of the after-life. Meanwhile the diamond itself moves within the containing sphere or circle, but very much more slowly, shifting through a Phase of the Moon during a life-period (see below). In order to make the transition to the getting of knowledge the Passionate Body is formed, with the desire for experience, to which is added the sensuous Husk for its active retrieval, forming a double gyre, which has the general form of an hour-glass. While Spirit moves alone within the diamond of Celestial Body, both Passionate Body and Husk move within the hour-glass, and since they are Lunar Principles their movement is measured according to the Phases of the Moon. Passionate Body remains opposite to Husk in their movement, ‘Passionate Body at Phase 15 when Husk is at Phase 1 and so on’ (AV B 199). Yet still the Principles can ‘create nothing’ (AV B 188), which therefore necessitates their reflection into the Faculties and the circle of the Tinctures. Since the Principles are Solar their natural order is hierarchical, whereas the Faculties, as Lunar relative to the Principles, are organised in the circle and face each other in conflict and relative equality. (See Plotinus and the Principles). 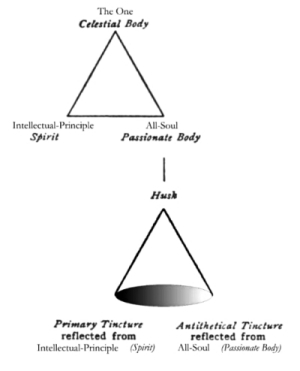 The moving Solar Principle, Spirit, is reflected in the primary tincture, while the Lunar Principle, Passionate Body, informs the antithetical tincture (see the Tinctures). The Husk is most intimately connected with the formation of the Faculties in the final stages of the after-life, more accurately considered as pre-life. The Faculties are creative and can originate new Karma; they are forms of division which are separated from one another across the circle of the Wheel, but each of the Principles is reflected in one of the Faculties. AV B 194, adapted, see Plotinus. AV B 199 The Principles move within their own gyres, the Spirit within the Celestial Body and the Passionate Body and Husk together in opposition to each other. However, in terms of incarnate man, they can also be seen as moving within the Wheel of the Phases. This is part of the paradox of the Principles: that they both underlie and overarch the world of the Faculties as archetypes, informing both the world of the unconscious mind and the world of spiritual ideals. They can therefore be seen as transcending the world of the tinctures, as in the diagram above, or lying inside it, as in the diagram to the left. ‘That the small wheels and vortexes that run from birth to birth may be part of the symbolism of the wheel of the twenty-eight incarnations without confusing it in the mind’s eye, my instructors have preferred to give to the Principles of these small wheels cones that cannot be confused with that of the Faculties’ (AV B 197). In this formulation the diamond (Spirit and Celestial Body) moves slowly in a clockwise direction, at the pace of a Phase for each life-period, while the hour-glass (Passionate Body and Husk) moves in an anti-clockwise direction. At the same time, Spirit completes a single movement of its gyre. Passionate Body and Husk also complete a single movement, although for part of the cycle the actual Principle in question has disappeared, as a consequence of the after-life’s simplifications. In this representation, the ‘dominant thought is to show Husk starting on its journey from the centre of the wheel, the incarnate Daimon, and Spirit from the circumference as though it received its impulse from beyond the Daimon’ (AV B 197-98). At human birth, Husk starts from Phase 1, at the centre of the figure, moving towards its own Phase 8, where it makes contact with the Phase of Will for that particular incarnation on the outer Wheel of the Faculties; meanwhile, Passionate Body, starting at Phase 15, moves towards Phase 22, where it makes contact with the Phase of Mask. At birth, Spirit starts moving from Libra, where it is in contact with the Phase of Body of Fate, reaching its Capricorn at the same time as Husk reaches its Phase 8: as Yeats summarises, rather telegraphically, ‘When Spirit is at edge of wheel Husk is at centre’ (AV B 199). The passage quoted here also intimates an important relationship between the Daimon and the Lunar Principles. ‘These cones are drawn across the centre of the wheel from Faculty to Faculty, two with bases joined between Creative Mind and Body of Fate, and two with apexes joined between Will and Mask’ (AV B 198). The figure therefore gives a geometrical representation of the way in which the Prinicples underlie the Faculties. The diamond of Celestial Body is actually in contact with the Wheel throughout the cycle, but is specifically activated at the point when Spirit passes through Libra, the point of birth, indicating the soul’s acceptance of its fated circumstances, Body of Fate. Husk and Passionate Body reach their respective points of contact during maturity in the paradigmatic life, while Spirit contacts the point of Creative Mind when it reaches Aries, death: ‘Death which comes when the Spirit gyre is at Aries is symbolised as spring or dawn; at birth which comes when the Spirit gyre is at Libra, as autumn or sunset. Incarnate life is night or winter, discarnate life is day or summer’ (AV B 201). The diagram to the right summarises these various elements, and also tries to indicate that the movement is actually figured within cones rather than triangles. The inner circle represents the Zodiac of the Celestial Body and is identical with the diamond. The gyre of Spirit completes a single movement within the diamond or circle between birth and birth (or death and death), while the diamond/circle itself moves with respect to the outer circle by a single Phase. In Yeats’s own comparison, ‘Diamond and hour-glass revolve on one another like the sails of a windmill’ (AV B 199), which is helpful as long as one imagines a rather idiosyncratic windmill with sails revolving in opposite directions, and the image also runs the risk of reinforcing a flattened, two-dimensional idea of the cones.
. In terms of the Principles, though, the vital factor is Spirit, and the key movement is the clockwise progression of the diamond-gyre around the circle, marking the position of Creative Mind. The movement around the whole circle of the twenty-eight incarnations marks one Cycle, but each life-period (birth to birth) and each incarnate portion of life also represents a single completed circle too. The cycle of the life-period is marked by the circuit of Husk and Passionate Body, although for part of this circle they are not apparent (Husk disappears shortly after it passes its Phase 15, and Passionate Body at some stage after it passes Phase 1). The incarnate portion of life is therefore represented by the movement of Husk from Phase 1 to Phase 15, and while Husk completes this half-circle, the Faculties complete a whole circle: ‘When Husk has reached Phase 8 they are at Phase 15; when Husk has reached its Phase 15 they are at Phase 1’ (AV B 201). Therefore one complete circle of the Faculties is equivalent to half a circle of the Principles and half of a Phase of the Cycle of incarnations (which Yeats confusingly refers to as ‘Will on circumference’). The following table sets out the parallel stages of the various Principles and the Faculties and their relationship with the stages of a single life-period (birth to birth). The names of the stages of incarnate life are not used by Yeats, and are the paradigm rather than the course of every individual life, where early death obviously affects the cycle, though probably in Yeats’s conception compressing it rather than cutting it short. The six stages of the after-life are given a single name, and can be amplified or sub-divided (see the stages of the after-life). The column of the "Lunar equivalent to the Husk" does not measure any Faculty’s actual movement, but indicates the position on the Lunar Wheel which corresponds to the Husk’s position on its Solar Wheel of Phases (a page on Solar and Lunar wheels is in preparation). These two Wheels are set at 90° to each other and run in opposite directions, so that ‘Lunar South is Solar East’ (AV B 198n), that is Lunar Phase 15 is Solar Phase 22. In terms of this Lunar Wheel, birth takes place at Phase 8 and death at Phase 22, and it is not really relevant during the after-life, when the Faculties do not exist and the Husk has disappeared. A page on Solar and Lunar Wheels is in preparation, to supplement the page on the Wheel. For further exploration of the Principles, particularly through the Automatic Script, see the essay "'The Spiritual Intellect's Great Work': A Discussion of the Principles and A Vision's Account of Death," by Graham A. Dampier, in the collection W. B. Yeats's "A Vision": Explications and Contexts, edited by Neil Mann, Matthew Gibson, and Claire Nally (Clemson University, 2012).